A regular speaker & media commentator, Reva has been featured on ABC’s 20/20, CBS Sunday Morning, and CTV’s Canada a.m. Reva regularly writes on gender equity, talent optimization and the new world of her work. She is the mother of three boys. 1MFWF: What do you mean by the “MomShift”? 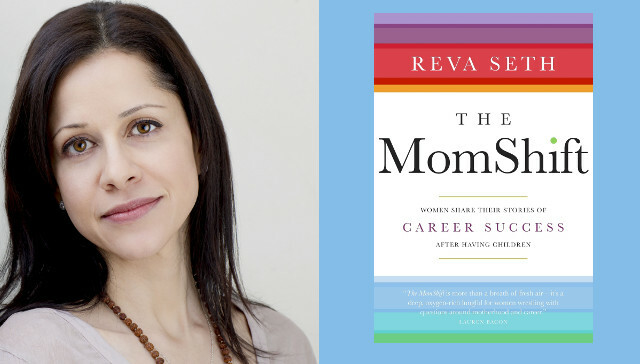 Reva: The title of my book, “The MomShift,” refers to a shift in how our culture views working moms, since currently we undervalue their contribution and potential. The MomShift is also a reference to changing how we think professional success has to look. Currently, the dominant or traditional model of career success was created and established by men with stay-at-home partners—this means we think that high value work requires a 24/7 mentality, continuous face time, and a linear career progression with no pauses for care or other life commitments. As a result, women face a deep motherhood bias—and it is hurting us. Research shows that being identified as a “mom” immediately means a woman is less likely to be considered for a role or hired—and if she is, she is offered significantly less money for the same work than a man or woman without children. Interestingly, men actually benefit from being identified as fathers since they are seen as more responsible and committed and on average are offered $6000 more for the same role and experience than moms or those without children. 1MFWF: You interviewed more than five hundred women for your book. You note that when talking about their return to work after having a child, you “repeatedly heard women say that the change they were looking for was not necessarily to work fewer hours but to control when and how they worked.” How common was it for them to find that control in the jobs they had held before having children? Did many of them have to find new jobs or become entrepreneurs? Reva: Yes, my research really found that the primary need driving a post-baby career change was a desire for greater autonomy in terms of how work happened. I consistently heard woman share that after children they decided to becoming consultants or entrepreneurs because they were happy to work long hours but they needed to be able to control when, how, and where the work happened—these changes often had other positive benefits including higher financial renumeration, new opportunities and impact but the initial motivation had been flexibility. I think we are only just starting to understand and appreciate how confining the current dominant model of work is and the talent leak that results from it. I regularly advise businesses that one of the best nudge shifts they can make is to find a way to engage this talent pool by being open to new types of work arrangements. 1MFWF: We often hear about the need for flexibility for new moms who are navigating the workplace with babies or toddlers. But we hear much less about the need for flexibility for moms of older children. Is there a point in parenthood where moms find they don’t need flexibility anymore, or is flex a theme throughout all stages? Reva: I would say that all people need more flexibility—whether it is for a sick family member, elder care for parents, or kids, the demographics suggest that we are heading into a care crisis. But yes, I think we culturally underestimate that older kids also require flexibility—there is a presumption that once they are in school it should be easier to manage, but the pull continues in terms of academic and personal issues, and we are only just starting to discuss that just as parenting is a long-term commitment. 1MFWF: Did any of the women you spoke with feel that they “had it all”? If not, did they feel like they could have it all if x, y, or z were to happen? Reva: I think many women I spoke with are wary of the phrase “having it all,” but if we are referring to women having a meaningful and successful career alongside a happy and fulfilling home and family life then yes, I do think the women I spoke with felt that they were doing it. The key to having it all is to define how you want your home life to look and to recognize that having it all is a personal and ever changing set of criteria. I think where this goes wrong for many woman and men is when we let outside forces tell us how this should look or happen. Women today have more choices than any other moment in history in terms of being able to create the professional and work life we want alongside the family and personal life we want—but the first step to having it all is knowing what we want, why and what works best for this stage in your career and family life. 1MFWF: How can our readers learn more and stay engaged with the MomShift Project? Reva: The best way to stay in touch as well as share your stories and experiences is to reach me on Twitter @RevaSeth or follow my blog: www.revaseth.com.